Whitefield is one of the oldest and developed areas of Bangalore. The area started seeing residential development since the 1990s. Many new residential projects and infrastructure development started thereafter. In 1998 when the first IT industry was started, it created a huge residential demand for the IT professionals. Over the years, as the residential and commercial space saw development, it boosted the potential growth of the locality and attracted homebuyers. In case you are searching for property in Whitefield, you will find a wide range of options in terms of price as well as the area. There are a lot of mid and luxury projects available in the area. In fact, the area also has the highest rental demand. Whitefield has seen a decent capital increase in last few years. To be precise the last 3 quarters of 2015, and first 2 quarters of 2016 saw a huge capital appreciation. According to a survey, most of the people looking for property in Bangalore are employees in IT/ITES companies. WHY SHOULD YOU INVEST IN A VILLA IN WHITEFIELD? Whitefield is considered to be the heart of Bangalore due to its great connectivity with the airport, railway station. Through Whitefield road, one can easily connect to Marathalli through HAL old airport road. Whitefield has broad bus connectivity with a wide range of services provided by BMTC (Bangalore Metropolitan Transport Corporation). One of the best social infrastructures such as Schools, colleges, shopping malls, the restaurant is situated in Whitefield. The Forum Value Mall, Phoenix Market City Mall, Park Square Mall, Inorbit Mall are the best place for shopping and for spending quality time with family and friends. Renowned super speciality Hospitals such as Narayana Multispecialty Hospital, Sathya Sai Hospital, and Vydehi Hospital are also present in the locality. Being one of the posh areas of Bangalore, Whitefield has the highest number of non-Bangalorean working here and hence hangout zones are also available here. The IT/ITES company’s project in Whitefield and in outer ring road area has contributed a lot to the growth of the area. Also, the area has seen a significant growth in the real estate business. So whether it is for investment purpose or for settling with family, Whitefield is the best location to choose. Whitefield area is the best place to invest on in terms of rental income. For those looking for rental income in Whitefield can easily earn 30000 and more monthly as rental income. Whitefield also has the high rental interest of 4%. Hence it is the best location in Bangalore and it is the great time to invest in the area to get a high return on investment. When you decide to explore Whitefield and have a look at all the real estate options available there then you can afford to miss out Daiwik Sparsh – pioneers in building villas in Whitefield. If you have dreamed of living a luxurious life then Daiwik Sparsh is the perfect option to choose. 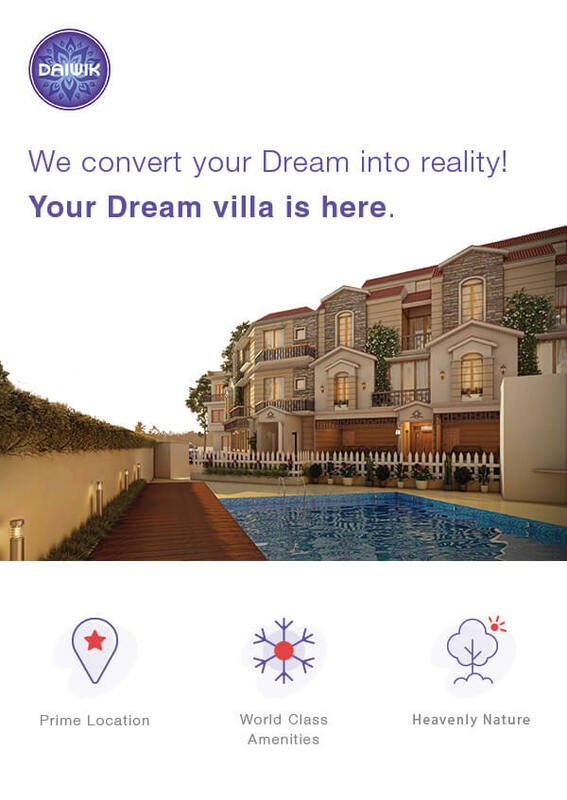 You get a luxury villa in Whitefield at the price of luxury Apartment. Sounds amazing right! Daiwik Sparsh is a trustworthy and leading real estate builder in Bangalore. Daiwik not only ensures to deliver a villa you dream of but also takes care of delivering quality. So while looking for options for investment or for self-residency do have a look on the Daiwik Sparsh locality. To know more about Daiwik Sparsh Click here. And to know more about our other Villas in Bangalore. Please click the link.